When you first notice that your backyard shed has starting to deteriorate, it becomes a waiting game to see how long it will keep standing. You might have been able to get through the summer with some of that wood in the shed rotting but with fall right around the corner it might be time to plan for your backyard shed removal. This is a job that is easily taken care of with one call to Junk King BucksMont. 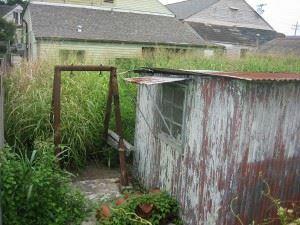 It doesn’t matter to the crew from Junk King how long that shed has been in your backyard or why it might be falling apart. What matters to them is that you want to gone. The two-man crew assigned to your appointment will carefully take apart that shed whether it is made from wood, galvanized steel or plastic. All those pieces will then be loaded onto the back of the truck for responsible disposal. Often that can mean recycling a lot of those elements. All of this means that your backyard shed removal is going to happen without you lifting a finger or putting your back at risk. You can turn around and use that same junk King crew to haul away all the rest of your unwanted items. It is a great chance to clear out the attic and garage of old furniture and appliances. You can make room in your closets by backing up all your old clothing, shoes and hats. As with the backyard shed pieces, all the rest of the stuff you want to get rid of could be repurposed or donated. Junk King Bucksmont is dedicated to staying far away from any landfill with the things they collect. As for the fee, you’ll only be charged a flat rate based upon volume. The junking crew will size up all the things you want to get rid of and present you with an estimate based on whether your will be filling up one half, one quarter or one third of the truck. That’s a price you’ll pay and it won’t change. The best way to get rid of your rubbish and handle your backyard shed removal is turn that job over to Junk King BucksMont. This entry was posted in Bucks County Yard Waste Removal and tagged backyard shed removal, junk, rubbish on August 31, 2017 by Junk King. Last updated August 31, 2017 .